Posted on Tue, Mar 20, 2012 : 4:35 p.m. Inmates work in Dexter Monday near the village's DPW building helping with the aftermath of the tornado that blew through the village last Thursday. In the wake of the tornado that swept through Dexter, the village has modified its trash and compost pickup schedule. Waste Management will begin compost pickup in the village two weeks early, beginning Friday, according to information from Courtney Nichols, assistant village manager. 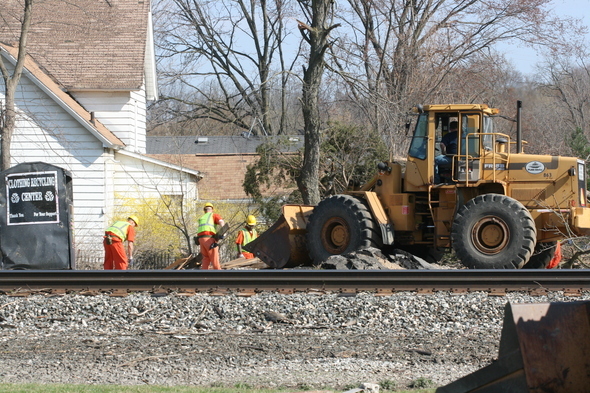 In addition, the Village Department of Public Works will continue to chip trees and brush as it is placed at the curb. The DPW will continue trash pickup in the tornado-impacted areas. Residents are asked to bring the trash to the area between the sidewalk and the curb so that the DPW can clearly tell it is trash to be removed from the site, Nichols said in the update. 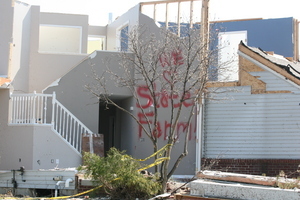 A home with a message in the Huron Farms subdivision. The Washtenaw County Building Department is available for structural building inspections at a cost of $80. A structural inspection may be necessary if residents need assistance with assessing damage. Permits are required for any structural repair and rebuilding, however no permits are required for shingle repairs, the update states. Contact the Washtenaw County Building Department at 734-222-3900 or the village at 734-426-8303 for more information. For more Dexter stories, visit our Dexter page. 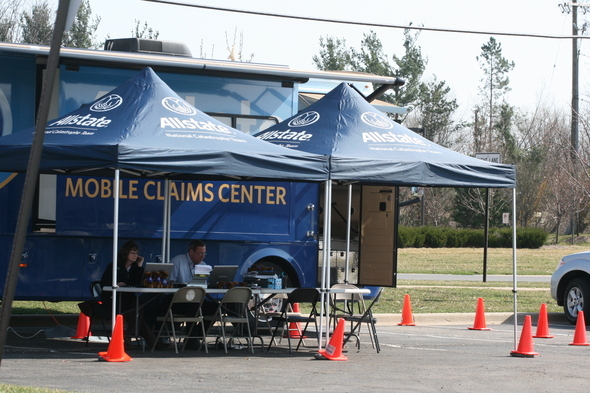 One of several mobile insurance claim centers located in Dexter Village. Wed, Mar 21, 2012 : 1:03 a.m.
(posted at other Dexter articles as well) I volunteer for a local woods (public schools property). We maintain the fairly-high-traffic pathways with wood chips. Storms such as this last one can (and did!) wipe out years worth of trail maintenance. Who can I contact in order to fill up my 6-yard dump trailer with wood chips, and save the community some trucking costs by trading them for my volunteer hauling labor?